There are some great areas to climb trad, sport and boulder found in urban, jungle and sea locations. 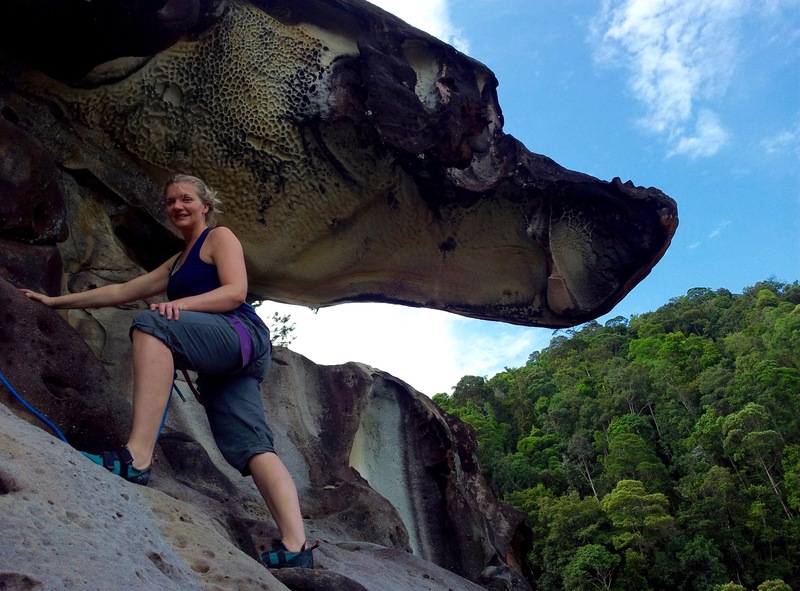 The rock quality is excellent with the tufa laden limestone of Bukit Takun, Bako National Park’s Grampians like sandstone and the hyped granite multi-pitches of the Dragon Horns. Malaysian people are very friendly, talkative, have a nice sense of humour, are helpful and interested in travellers. The food varies from nasi lemak (mild coconut rice, sambal, one or two anchovies and peanuts) or laksa (a delicious spicy, sweet, sour seafood broth with noodles, bean sprout, chicken, prawn), char kuey teow (malay pad thai), beef rendang, seafood, deep fried chicken (do not go to KFC just because it is on every corner), Chinese bbq pork rice, wonton noodle soup and the best Indian food in the world. The fresh fruits, juices and iced bowls of weirdness are fantastic deserts on a hot day. What to take — Mosquito spray, sweat towel, shorts, flip flops, light approach shoe, sun screen, (think 30 degrees all the time) and sun glasses. Sport climbing — We took a 70 meter PETZL Volta 9.2 rope, 14 quick draws, DMM Pivot belay device, chalk bag, and the ARCTERYX AR-395a harness. 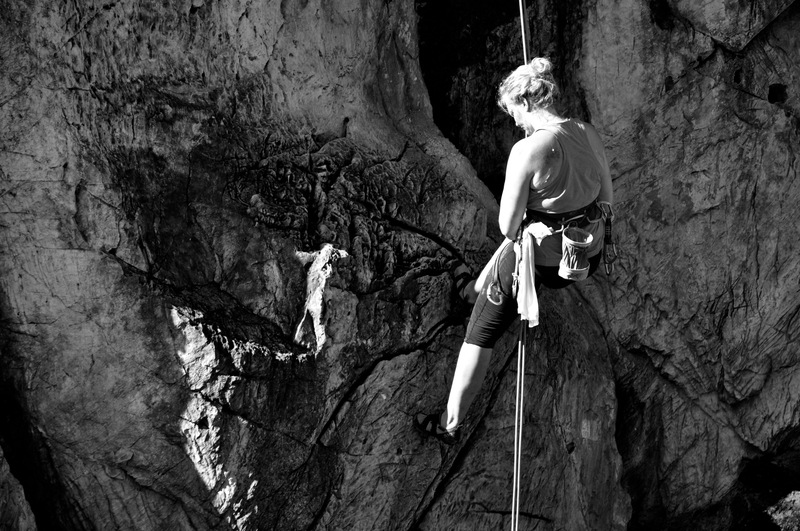 Trad climbing — Double 50 meter ropes, 8 runners, 8 draws, set of nuts, some friends .5, .75, 1, 2, and helmet. General Information — A return flight to KL is about 600 Euro. 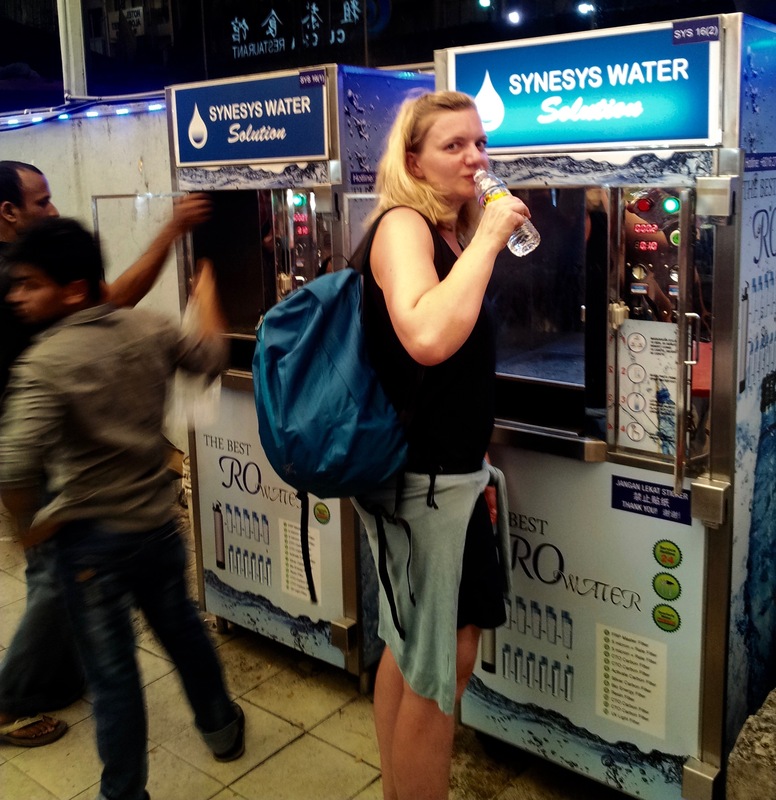 Drinking Water — Water machines are around to refill your bottle, here Kathi drinks about 2 cents worth of clean water. Kuala Lumpur is the capital of Malaysia, the city has the largest community of climbers and highest concentration of routes. Damai wall and Nymak wall can be found 3 to 5 km north west of the Batu Caves and are great spots to meet locals, get rid of jet lag and get used to the humidity. 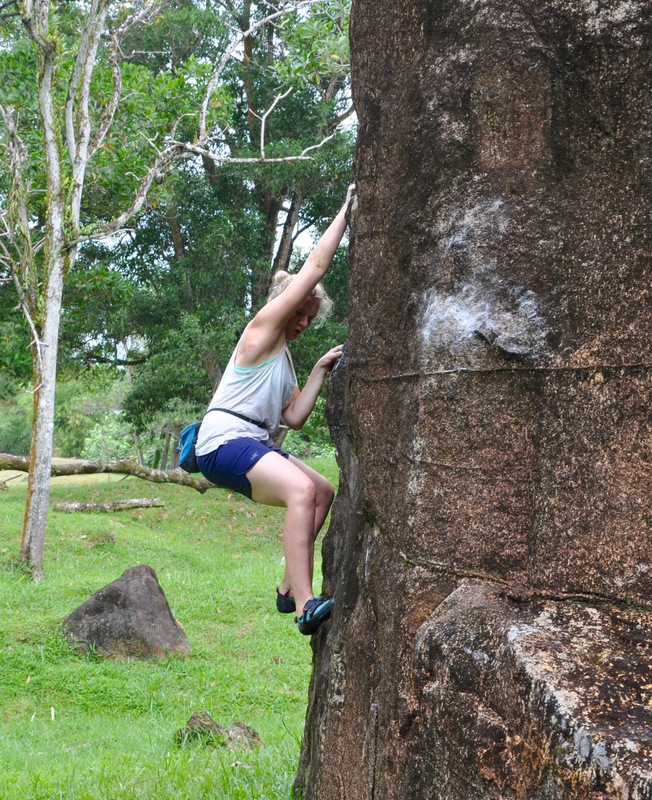 Bukit Takun, 28 km north of KL is the must climb crag in the area with long tufa drips, pockets, crimpers, finger cracks, dihedrals and bands of granite. 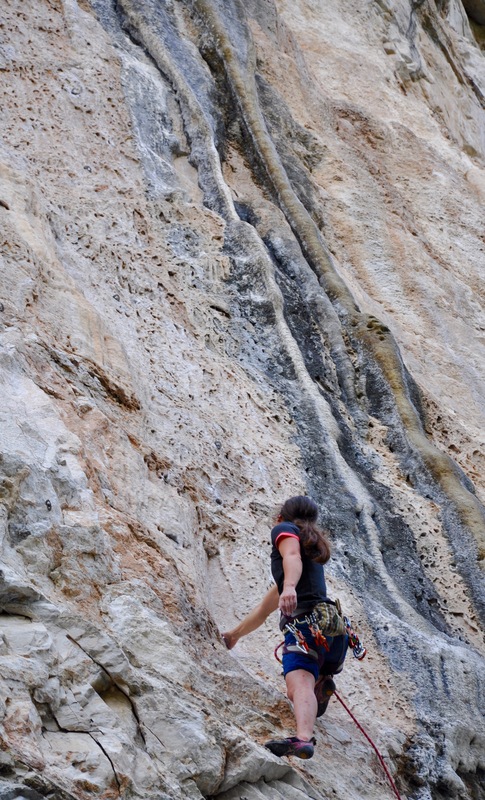 There are also some multi-pitch sport routes at Takun but the wall can be sunny, so climb early and fast. Route beta — Climb at Damai wall 5c to 6c, with long 30 meter routes and some with 2 to 3 pitch. Nyamuk has harder sport routes 6b to 8b, and 20 to 30 meters long. How to get to Damai wall (Batu Caves area) — Direct with public bus from Medan Pasar (the corner next to Pacific Express hotel which is also close to central market area) to Damai Wira get off at second last stop. Rapid KL bus 170, 171, 202 the sign on the bus says Damai Wira (6am to 11pm every 15 minutes 2.5 RM one way). Then walk 5 minutes to the big cliff you see. Gua Damai Extreme Park has all the gear if you need to rent something while in KL, they are a great bunch of people really helpful. How to get to Nyamuk wall (Batu Caves area) — Direct with public bus from Medan Pasar (corner next to Pacific Express hotel-close to central market area) to Damai Wira get off at Sri Gombak which is just a few stops after you have passed the Batu Caves. Rapid KL bus 170, 171, 202 (6am to 11pm every 15 minutes 2.5 RM oneway). Walk 10 minutes to the cliff. Where to stay and eat — There are many Hotels in the Batu Caves area because Batu Caves is a Major Hindu and tourist attraction (an entertaining excursion). We stayed at Lavana Hotel-75RM (No.19, Jalan Sri Selayang, Batu caves). 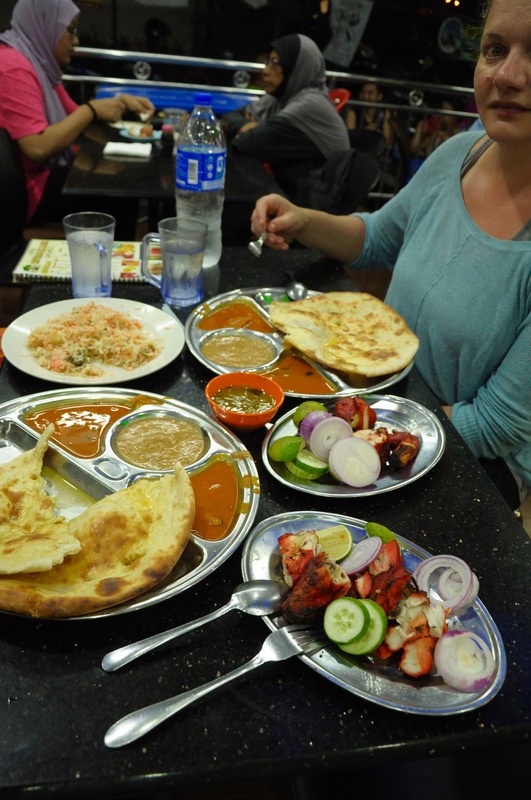 There are also lots of good Indian restaurants in the area. We can recommend roti canai 1.5 RM, naan, 3 RM, rata, dal, rice biriyani 8 RM, tandoori chicken 6 to 8 RM, packet ice kopi 2 RM, nasi lemak 4 RM. 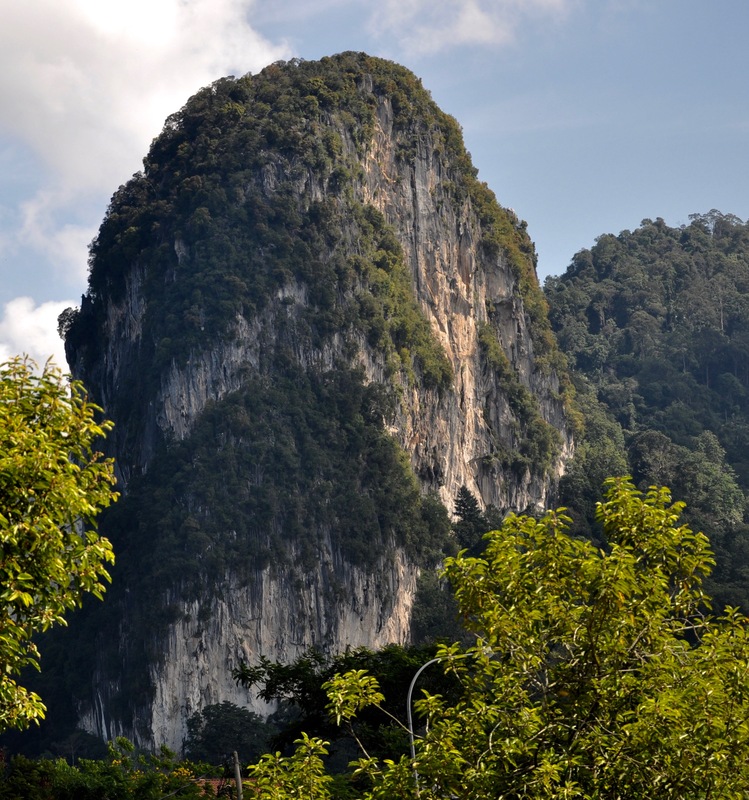 Bukit Takun is a 250 meter tall oval outcrop with a lower band of granite and limestone on top. It is 10 km north of Batu caves, near Templer Park Country Club and has single pitch sport, multi-pitch sport and trad routes. The monolith is divided into a few different areas. At the north facing bottom, you will find Elysian wall with 10 routes. From here as you walk up the cliff base are sectors Battlefield and Jenga, both full of tufas and home to 30 routes. The next wall is Lower Slopes with lots of granite friction and limestone vertical routes home to 25 routes. The area is rounded up with Galactic Cliff and Granite base (seen on the upper right base are) where there long multi-pitch routes to the summit. Beyond this are two less visited crag, Campground and Big Hole. Route beta — There are some multi-pitch about 5 to 7 pitches but start early and on an overcast day. There are 150 sport pitches in 10 sectors. 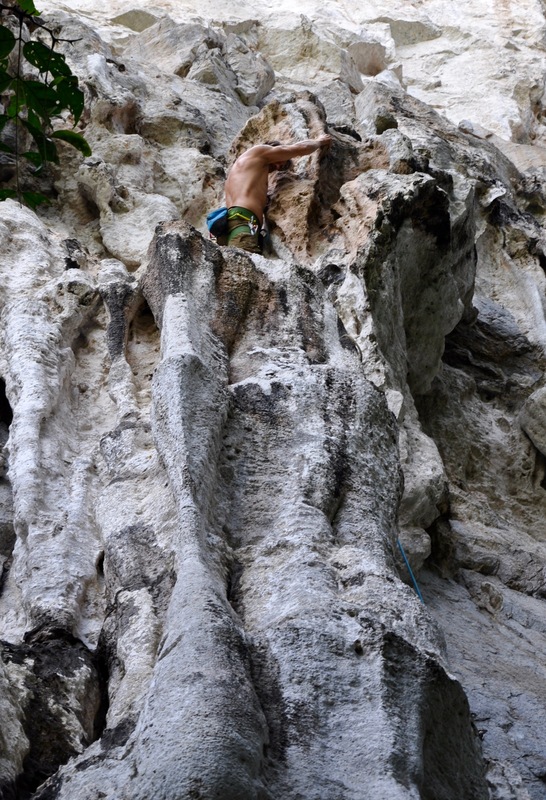 There are lots of great tufa routes, in a quiet area, with solid rock, and lots of green jungle. This allows the rock to stay dry in a rain storm. Anger Management-7a, is the route in the photo to the right. How to get there — Bus SJ 150 from north side of Medan Square to Rawang Templer (get off opposite of the Shell station), you will see the cliff, after the bus drives down a big hill, 3 RM. It takes 1 hour early in the morning, 8am and two hours back at 6pm. From the Shell you must walk 30 minutes to the cliff. Uber is used by most Malaysians. Where to stay and eat — Stay in KL or Batu Caves area. Eat and fill up your water at small strip mall just one block from the Shell petrol station. There is a restaurant, a water machine and two small shops to buy snacks and fruit. Route beta — Ten bolted pitches and lots of undeveloped bouldering on Grampians like sandstone. How to get there — Take Bus No1 (Rapid Kuching Co) from Kuching station from next to Grand Margarita hotel. This bus goes to Bako, it is a 45 to 60 minute bus ride. 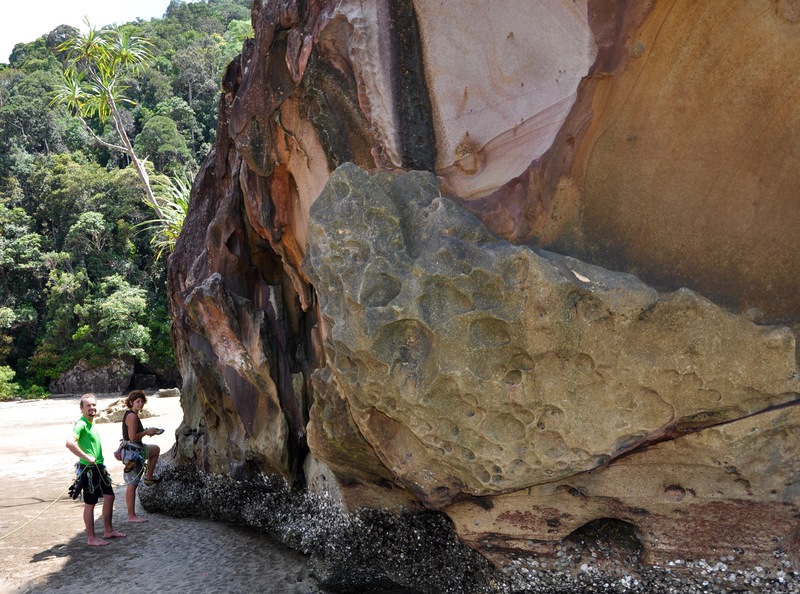 Then you must take a 15 minute boat ride from Bako into Bako National park. Bus No1 runs 7am to 5.10pm (on the hour) to Bako, return 8.30am to 5.30pm (every hour). Cost – public bus – 3.50 RM (one way per person), taxi – 45 RM (one way), boat – 20 RM (one way per person), park entrance – 20 RM (per person). 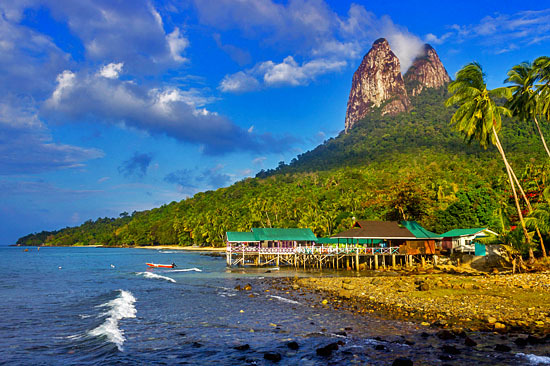 Where to stay and eat — Try to stay at least one night in Bako National Park, two is better. You can choose between several simple and more simple types of accommodation: Forest lodges with fan or air con, private room in lodge or hostel, a bed in a hostel or a camp spot (need to bring your own camping equipment). Prices go from 5 RM for camping up to 225 RM for a whole air con lodge. More info and booking through the official website of Sawarak Government but book at least 3 weeks in advance. There is a restaurant in the park that offers breakfast, lunch, dinner, snacks and drinks. 7.30am to 9pm. Food is cheap, drinks all right: water (1.5l) 4 RM, Pepsi 4 RM, plate of food 3 to 6 RM. No alcohol allowed in Park. 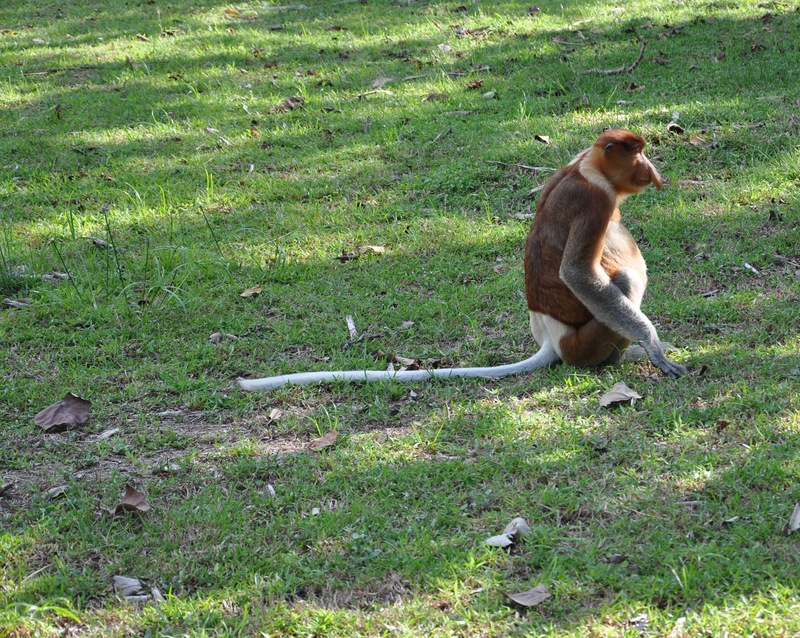 Rest day Activities — Watching the rare Proboscis monkeys, Bearded pig, loud and colorful birds, and at night the park wardens do a 90 minute boardwalk tour. The highlights being strange frogs, and snakes (10 RM). There are many hiking trails, and some ultra warm swimming in the sea. Route beta — There are some routes in the Fairy Caves park. To find them go up the stairs and before you enter the caves there are two multi-pitch routes but you must batman up to start anchors. A long stick clip (4 meters) is needed to clip the lowest bolt. (6b and 6b+, 2 pitches). Also if you follow the stairs into the caves and up to the last platform which overlooks the fields below and the follow a faint path to ledge there are 4 routes, 15 meters 5c to 6b. Entry fee to the Fairy Caves is 5 RM. There are also about 40 other routes near the entrance of the Fairy caves but are on private property and are surrounded by a chain link fence. To access the climbs (batman wall) you must get the local villager to open the gates, Joseph at +60138035516 and it costs about 10 Euro a day. Where to stay — Stay in Kuching. How to get there — Bus No2 leaves from Kuching bus station starting at 6am to Bau (30 km). 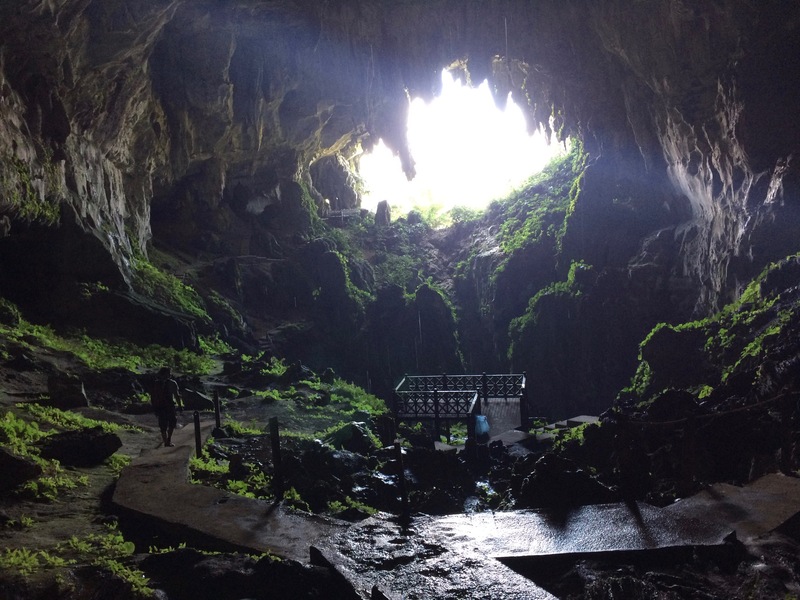 From Bau take a bus, share minivan 2.5 RM, taxi or hitch hike (the local will help) to Fairy Caves (9 km). Where to eat in Bau — There are a few food courts near the main bus terminal. Try an ABC on a hot day, it may be crazy looking but tastes good. 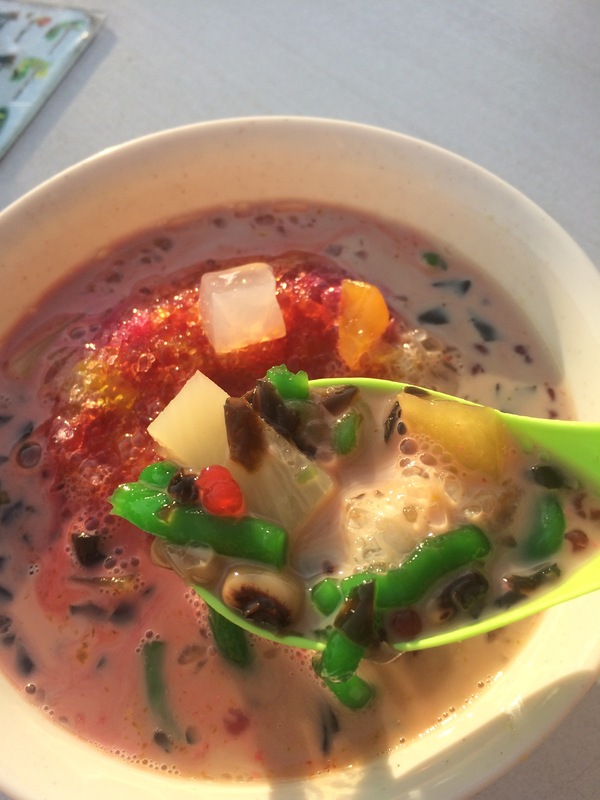 A basic ABC is: shaved ice with condensed milk, fruits, cendol, jelly, beans, sarsi and rose syrup, coconut milk, fruit and various toppings can be added (corn). Route beta — There are two sandstone boulders with a few developed problems V0 to V4. You can do some traverse circuits or make up your own variations. How to get there — From Kuching bus terminal take City Link bus (Number K5) to Cat Museum (1.5 RM) and then walk around the west side near the BMX track and north of the track you can see the boulders. 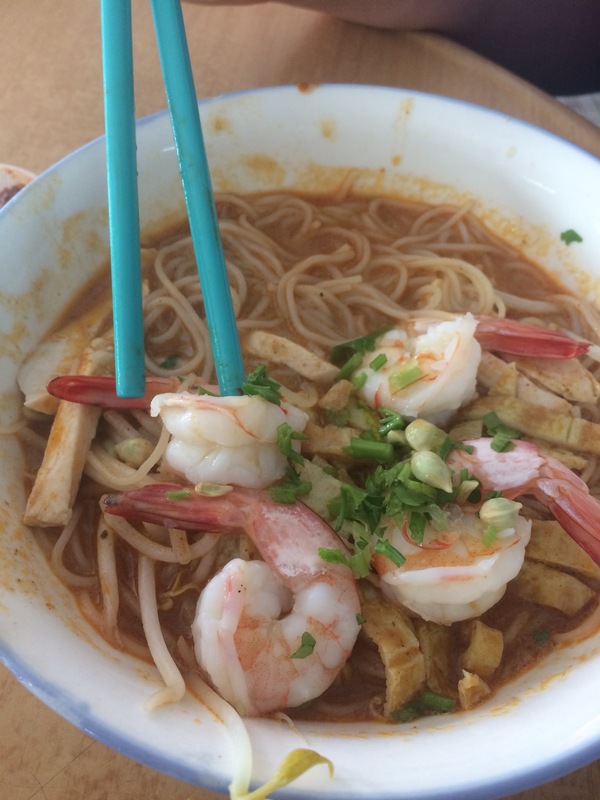 Eat in Kuching — These restaurants we ate at multiple times, they are for sure most tasty. Chong Choon Cafe (Jalan Chan Chin Ann) for laksa. Hong Kong Noodle House (Jalan Pandungan) for wonton, kailan and bbq pork. Maha Shafi (Jalan Barrack) Indian for roti canai and curry. 65 RM for a double with aircon. This island has many trad routes on granite towers, about 220 to 300 meters long (6 to 10 pitches). There are a few bolted routes but development is happening constantly. The sea is clean and warm, and the jungle can be hot and adventurous (it depends on your ability to navigate the right trail to the base). In 2007, the Mammut Pro Team went to Perak and Perlis for their annual team trip. David Lama, Reini Scherer, Cédric Lachat, Christina Schmid, Anna Stöhr, Katharina Saurwein, and Juliane Wurm cleaned, climbed and bolted routes at two crags Lost World of Tambun and Bukit Keteri. 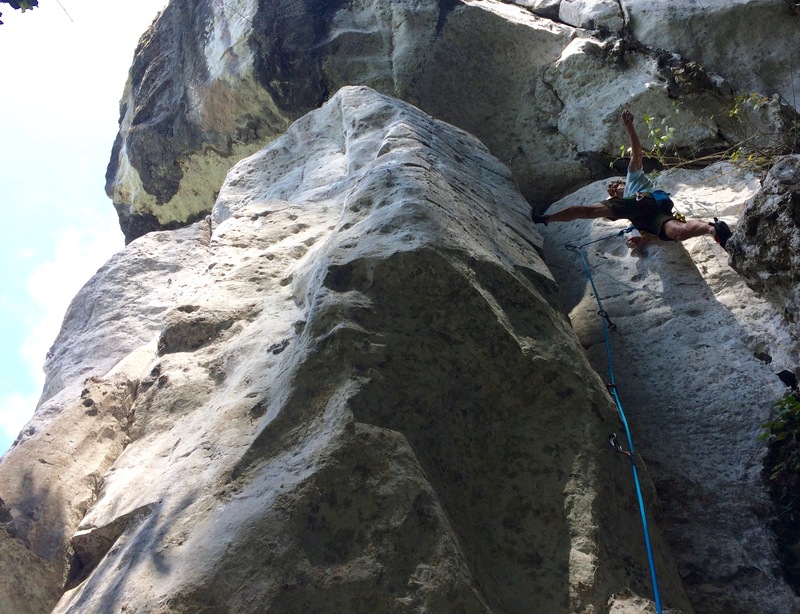 At present some of the Kuala Lumpur locals are trying to develop some new crags but it is a little hush-hush. Some of the routes are now missing the first hangers and it does not see a lot of visitors.